The stationary bike/desk hybrid is nothing new. But, till now, design seems to have never been of much of consideration. 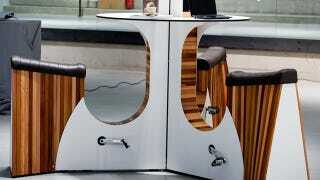 WeBike is a pedal-powered desk that also happens to be a very pretty piece of furniture. Designed by Belgium's We-Watt, the WeBike's pedal-to-power design converts gentle cycling action into electric energy. Its aluminum-and-steel body is embellished with reclaimed cedar wood, and its top is made of a high-pressure laminate. An LED ring display in front of each seat shows how much power is being generated by the worker/cyclist and how much AC power is available for charging their device/s. According to We-Watt, the system can generate around 230Vac/30Watts of output per seat. Each seat can generate an average of 230Vac/30Watt of output. The bikes can be arranged in a single row, for office adaptability.